I’ve been in Ireland for two recent landmark votes. One for gay marriage and the one last May to repeal the prohibition on a woman’s right to choose. There were no slim margins. Both passed decisively. Just before the vote in May I encountered some women who were campaigning for the repeal. They were concerned. There had been massive infusions of money, much from US right wing Christian conservatives, to defeat the repeal. And the ‘Yes!’ campaign was outspent ten to one. The graphic and misleading signs were everywhere. 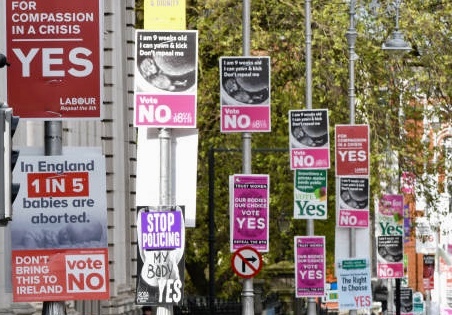 This photo from the Dublin area, I believe, shows a balance of signs but in other areas the streets were lined with only ‘No’ posters. The ‘No’ narrative was loud and bombastic and aggressive. A very familiar noise for those of us in the States who champion a woman’s right to choose. A loud and aggressive and abusive shouting not at all unlike what is currently happening in the States. A shouting that gets more deafening as we approach the elections in November. A shouting rooted in patriarchy and a belief in white supremacy. But here’s the thing. All that shouting. It didn’t work in Ireland. Citing the cautionary tale of our 2016 presidential election, thousands flew home to Ireland to cast their ballots. 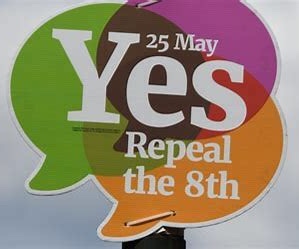 And across Ireland the people said ‘no’ to the abusive narrative and ‘yes’ to a woman’s right to choose. I hold great hope that the same will unfold in our upcoming elections. I hold great hope that we will, like the Irish, choose to cast our ballots rooted in justice.